Looks like the kind of “lady” my luck turned out to be was more like a woman scorned. As you all know I’ll be flying off to SITScation in Las Vegas this weekend. Well that lovely lady luck disided that in addtion to the amazing makeover I’m about to tell you about I also needed to take along with me, a head cold and just for good measure bloating and cramps! Obviously I’ve done something to tick you off. Though what it could be escapes me. I’m a good girl, I love Elvis and America too. Nearly all of my energy goes into raising this gaggle of kids you bestowed upon me (an honor to be sure). I take care of animals, lug around re-usable shopping bags, mulch, recycle and give to charity as though I had money! Why then, WHY, did you see fit to give me a raging head cold just before my big weekend? Furthermore what possessed you to also send along your evil minion, “Aunt Flow” to add insult to misery? 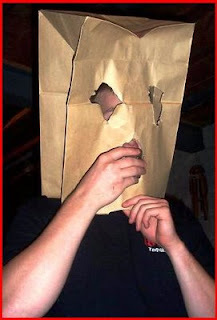 That’s it I’m going to go shopping, and guess what I’m gonna use PLASTIC STORE BAGS! Thank you for your support! 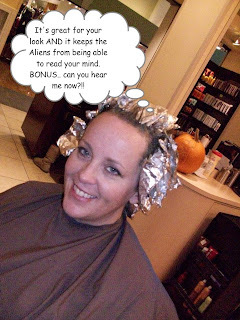 You know if it weren’t for the fact that Bubbles Salons did a jaw dropping job making me over, I’d just stick a bag on my head and go to Vegas much like The Unknown Blogger.. Yes the cup says Psycho, got something to say about it? Huh do ya? You feeling lucky, punk? Oops, having a pre-caffeine PMS moment there sorry. 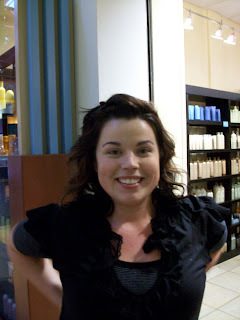 Enter my own personal Super Hero, Erica Ritchie, manager of the Arundel Mills Bubbles Express location. This little pixie is proof that good things do come in small packages. Note to salon equipment manufactures, please consider making shorter sinks for the vertically challenged stylists of the world. Short people are people too (he he). Packing mad stylista skills and some serious heavy hitters from Cibu: Ancient Secrets for Modern Hair Erica went into full on hair-kung-fu mode on my frizzy, damaged, tacky-trailer-tresses. Don’t I look HAWT?! I do and you can’t tell me I don’t so there, neener neener! 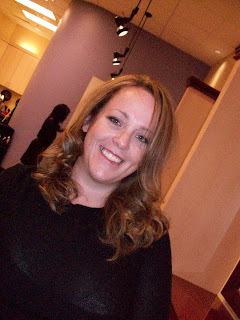 Erica gave me the Bubbles Color package: cut, full color, full highlights, conditioning treatment and style. If you are near any of the 38 Bubbles Salons in the MD, DC, VA and PA area you can get a DEAL on this too just click HERE (offer good through Nov 2, 2009). Even if you aren’t near a Bubbles though you can still join me tomorrow over at Cheapskate Mom’s blog were you’ll be able to pick up some tips from Erica, learn more about the products she used on me, see video styling tutorials… AND what would Drabby To Fabby Friday be without a giveaway? I’m not sure what that giveaway will be but it will undoubtedly be GREAT!